This was a rebellion of the Paiks, i.e., the landed militia of Orissa to whom the English conquest had brought little but ruin and oppression. Brave and undaunted as the Paiks were in comparison with the British Sepoys, the nature of the country and their intimate knowledge of it gave them an advantage which rendered the contest very severe. Sterling has written about the Paiks who combine with “the blindest devotion to thewill of their chiefs, a ferocity and unquietness of disposition which have ever rendered them an important and formidable class of the population of the Province”. They were paid by service lands which they cultivated with their own hands in time of peace subject to the performance of certain military and police duties whenever called upon by their chiefs. People from all classes, Chasa, Pana, Kandara, Bauri, Mohammedans, Telgu, Kaisthas, etc. could become Paiks. In fact, they constituted the second line of defence like the Territorial Army of today. The Paiks of Orissa were divided into three ranks, distinguished by names taken from their occupation, or the weapons which they chiefly used, viz. The Paharis, who carry a large shief made of wood covered with hide and strengthened by knobs and cirlces of iron, and the long straight national sword of Orissa, called the Khanda. They are stationed chiefly as guards. The Banuas, wo now principally use the matchlock (in lieu of their old missile weapons), but have besides a small shield and sword. It was their duty to take the field principally and to go on distant expeditions. The Dhenkiyas, who are armed with bows and arrows and a sword, and perform all sorts of duties. The war dress of the Paiks consists, or did consist, of a cap and vest made of the skin of the tiger, or leopard, a sort of chain armour for the body and thighs, and a girdle formed of the tail of some wild animal. Their ferocious dress combined with their irrestible courage in the battle ground terrorised their foes. They knew fighting well, both in the open field and in the jungles. They fought a good many bloody battle with the Mughals and did not prove inferior to any infantry which the Marathas ever brought into the field during their government of the Province. A body of local landed militia of this kind might have been a tower of strength to the British Government, had liberal and conciliatory measures been adopted from the first. But by a fatal and shortsighted policy, Major Fletcher had been allowed to resume their service lands shortly after the confiscation of the Khurda estate. Nor was this all. Deprived of the lands which they had enjoyed from time immemorial, they were subjected to the grossest extortion and oppression at the hands of the Sarbarakars and other underlings to whom the Government entrusted the collection of the revenue, and also to the tyrannies of a corrupt and venal police. A leader was all that was required to fan the lurking embers of rebellion into open flame. The opportunity produced the leader in the person of Jagabandhu Bidyadhar Mohapatra Bhramarbar Rai, an officer who had inherited from his ancestors the post of Bakshi or Commander of the forces of the Raja of Khurda, being second only to the Raja himself in rank. Besides Jagirs or grants of land and other perquisites, the family of Jagabandhu had held for several generations the valuable estate of Killa Rorang at a low quit-rent. This estate was in Jagabandhu’s possession at the time of the British conquest, but eventually he was dispossessed when in June 1814 the Government passed orders that no settlement should be made with him, until he should have established at little to the property in the regular course of law. Jagabandhu was reduced to beggary and for nearly two years derived his maintenance from the voluntary contributions made by the people of Khurda for his support. He was constantly attended by a ragged tribe of followers bearing the insignia of state pertaining to his former condition. When advised to institute a suit for the recovery of his estate he evinced the greatest reluctance to do so, pleading his want of means, the degradation of suing as a pauper, and the uselessness of any reference to the courts established by a foreign Government. This was the position of Jagabandhu in March, 1817 when a body of Kandhas, four hundred strong, from the State of Ghumsur crossed over into the Khurda territory and openly unfurled the banner of revolt. The Paiks rose as one men and joined them under the their former leader, Jagabandhu. They proceeded to attack the police station and other government buildings at Banpur where they killed upwards of a hundred men in the employ of the foreign government and carried off some fifteen thousand rupees worth of treasure. The rebels then marched on Khurda itself, increasing in numbers as the proceeded. Their success at Banpur had set the whole country in arms against the British and seeing the hopelessness of resistance the whole of the government officers stationed in Khurda sought safety in flight. All the civil buildings were burnt to the ground by the rebels and the treasury sacked. Another body of the rebels advanced into Paragana Lembai and murdered one of the native officials who had rendered himself obnoxious. On the intelligence of these events reaching Cuttack, the British Government at once despatched such a force as they thought would be sufficient to quell the disturbance and restore order. One detachment marched direct to Khurda and another proceeded to Pipli to protect Paragana Lembai. The Magistrate thinking that his presence would help to restore order, set out on the first of April, accompanied by a detachment sixty sepoys with the intention of joining the force which had proceeded to Khurda. On the evening of the following day he arrived at Gangapada, a village only about two miles (3.2 kilometres) away from Khurda. A barricade had been erected here, which was defended by a considerable body of rebels. The British troops were fired upon, and as it was growing dark, it was resolved to halt for the night and attempt to force the stockade early in the next morning. A letter was sent off to the officer who had proceeded to Khurda begging him to march out with his force from Khurda so as to place the enemy between two fires. Early next morning the messenger returned with the intelligence that the village of Khurda had been totally destroyed, and that the troops were nowhere in the neighbourhood. There was nothing for it under the circumstances but to beat a speedy retreat. No provisions had been brought from Cuttack and none were to be procured on the spot. The sepoys were worn out with hunger and fatigue and the number of the rebels gradually swelled to about three thousand men. As soon as the retreat was commenced the Paiks opened a brisk fire. The English troops kept as much as possible to the open, the Paiks on the other hand, kept well under cover of the jungle, from which they suddenly emerged now and again to fire, or to secure whatever baggage had been dropped or abandoned in the confusion. “This instant returned; after a most fatiguing march of a day and night, from Khurda; I can only write for the information of His Lordship in Council, that my retreat was forced, and that the whole of the Khurda territory is in a complete state insurrection. The insurgents call upon the Raja of Khurda, and Jagabandhu issues orders in his name. Their avowed intention is to proceed to Puri and reconduct him in triumph to his territory”. The detachments of sepoys which had proceeded to Khurda and Pipli were not more fortunate than the Magistrate’s party. The officer in command of the Pipli detachment, in attempting to force the rebel position at Gangapada and effect a junction with the Khurda force, was killed at the head of his men. Both detachments were compelled to retreat, with the loss of all the baggage, to Cuttack via Pipli. The latter place fell into the hands of the Paiks, who sacked it and burnt the police station. On the other hand, an officer who had been despatched with a force for the protection of Puri, reached that town on the second of April and found all quiet there. His progress had not been molested in any way, and he wrote to recommend that a force should be detached for the special duty of falling upon the rebels and bringing on a decisive action with them. Accordingly on the ninth of April, an officer with five hundred and fifty men and few guns, marched on Khurda, and on the twelfth of April martial law was proclaimed in the Khurda territory. On the morning of the same day a large body of the isurgents assembled at Sukal, a small village near Puri. In the evening they entered the town by the Loknath Ghat, and burnt the Government court-house and several other public and private buildings. The houses of the European residents were situated then on the sea-shore about half a mile (0.8046 km) from the town. In these the Indian officers of the Government took refuge. The troops were located in the bungalow of the Salt Agent. On the morning of the thirteenth of April, the rebels emerged from the jungle which skirted the town on the east and opened a desultory fire. The sepoys returned it, and the contest was continued for about two hours, but at length the sepoys charged the enemy and drove them back into the town. The success was, however, only temporary. The insurgents returned in greater numbers, having been reinforced by others of their own party and joined by many of the rebels belonging to the temple and to the Raja’s private establishment. Some of the inhabitants of the town also joined the rebels, and the priests of the temple openly proclaimed the fall of the English rule and the restoration of the authority of the ancient line of sacred kings. Being thus hemmed in on the three sides by the insurgents and the sea, the British deemed it advisable to beat a speedy retreat to Cuttack by the only road till left open. Provisions were beginning to run short, and it was found impossible to procure a fresh supply. It was important, too, to prevent the Government treasure from falling into the hands of the rebels. Puri was, therefore, abandoned ; and the fugitives, among whom were the Salt Agent and the Collector of the Pilgrim Tax, reached Cuttack on the eighteenth. All communication between Cuttack and the southern portion of the Province was now completely cut off; consequently, nothing had been heard of the force despatched to Khurda on the ninth of April, and the greatest apprehensions were entertained for its safety. The detachment, however, reached Khurda without encountering any opposition; and the officer in coomand, on hearing that the insurgents had gone in great force in the direction of Puri, proceeded against them by forced marches. On the second day after leaving Khurda he came upon the rebels, about a thousand strong drawn up behind a line of embankments. The Paiks, as they were small in number and ill equipped, could not successfully encounter this large body of disciplined and better armed troops and had to retreat into jungle. The British force resumed its march on Puri, entered the town, and captured the Raja who could not be successful in his escape. Several other encounters took place between the British troops and the insurgent Paiks, and the rising spread to Cuttack, where it was stamped out without much difficulty. British authority soon re-established itself everywhere, although the country did not at once recover its accustomed tranquility and security. Bands of Paiks continued to infest the jungles of Khurda for sometime after the pacification of the rest of the country, and disturbed the Britishers in their administration. In May, 1817, two English Judges were posted at Khurda to award punishments of death, transportation and long term imprisonment to the imprisoned rebels. In the early part of the year 1818, the British Government had also to take recourse to military operation in the jungles of Khurda which lasted till the year 1826. In this operation bands of Paiks, including Bakshi Jagabandhu, were hunted down and many were brutally murdered. The British Government appointed a Commission to investigate into the causes of this outbreak. The Commissioners reported that the Government itself was to a large extent to blame and that the peasantry had many real grievances to complain of. The resumption of large tract of service land, the currency regulation which compelled the people to pay their land tax in silver instead of in cowries as before, the heavy salt duty, the extortions and chicanery of subordinate officials, were all bitter grounds of discontent. These grounds can very well show that the Paik Rebellion of 1817 was a common man’s agitation, it was not initiated by any aristocratic blood. In fact, the Raja of Khurda and Bakshi Jagabandhu joined the rebellion were accepted as leaders by virtue of their past postions. Raja Mukunda Deva died a captive in November, 1817. He was the last king of Khurda and after him his successor came to be known as the Raja of Puri, the title of ‘Raja’ being only nominal, and he depended on a political pension. The management of the Puri temple, however, remained in his hands. Ramachandra Deva III(1817-56), the son of Mukunda Deva, built a new palace on the Car Road at Puri and amassed much wealth by his thrifty habits. He was succeeded by Birakishore Deva II (1856-62) and the latter by Dibyasingh Deva II (1862-77) who was transported for life on a charge of murder. His successor Mukunda Deva III died in 1926 and was succeeded by his adopted son, Ramachandra Deva IV, who was the Superintendent of the Jagannath temple till 1960 when the management of the temple was taken over by the Government of Orissa. The present king of Puri (Gajapati) is Sri Dibyasingh Deva III who is son of Sri Ramachandra Deva IV. In 1827, the people of Tapang Garh under sthe leadership of Samanta Madhaba Chandra Routray, their Dalabehera, revolted against the oppressive alien rule of the British. 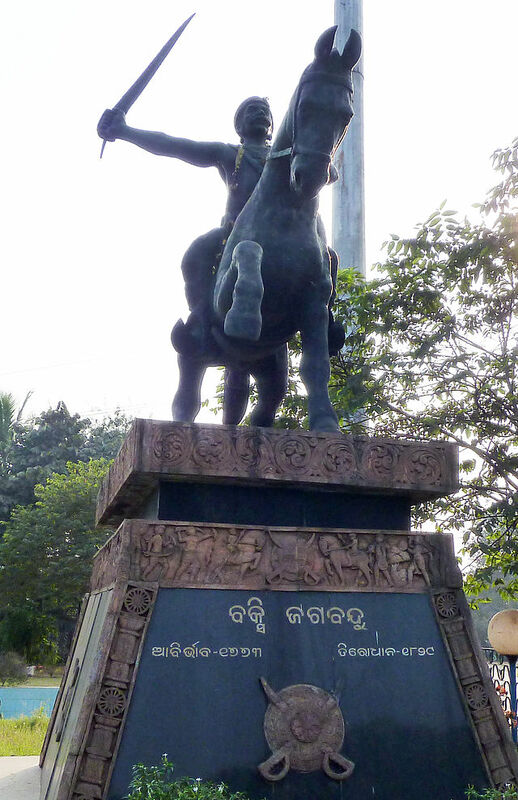 Since the Paik Rebellion of Khurea (1817-18), the people of this area did not pay rent to the British Government as a consequence of which on the 23rd May 1827, one British Officer with some sepoys was sent from Khurda to collect arrear rent from Tapang. At the instigation of Madhaba Chandra, the people refused to pay rent to the British. One Govardhan Bairiganjan shot two Englishmen to death. Some British sepoys were seriously wounded in the scuffle. The British authorities took a strong view of the situation and Lieutenant-Colonel Harcourt sent an ultimatum to the Dalabehera to Tapang to clear the arrear rent immediately and surrender himself in the court at Khurda. But Dalabehera Madhaba Chandra paid little heed to ultimatum and prepared himself for a confrontation with the British. Col. Harcourt marched to Tapang with a contingent of British force in June, 1927, and met the rebels in the battle field of Kandagoda near Tapang. After a protracted fight the rebels were repelled and the revolt was finally subdued. Dalabehera Madhaba Chandra subsequently surrendered to the British and was pardoned for his nobility and bravery.